Currently, wind generation sites are the cheapest version to build in the United States. Solar tends to be significantly more expensive to develop and construct. Creating one site for both forms is much more affordable, yet offers all the advantages covered above. Many people think that improved low-carbon technologies are the only things required to enjoy a future powered completely by renewable energy. However, most renewable energy developers will tell you that we first need to find the right source. This usually comes down to two options: wind or solar. The truth is that neither is sufficient on its own. While wind and solar can generate large quantities of power, they both suffer from certain challenges that greatly hinder their acceptance as the replacement for traditional forms of energy. The way forward for renewable energy developers is to understand that they must use these two sources together to produce the power this country needs on a consistent basis. At the moment, renewable energy developers are facing a major challenge: the grid system. Its current setup simply isn’t optimal for making the most out of our renewable sources of energy. The reason for this is fairly simple. The sun only shines during the day. For the most part, the wind picks up at night due to changing temperatures. This means that both are intermittent suppliers of renewable energy. The grid simply can’t provide consumers with a reliable source of the power they require. Solar power also runs into numerous overgeneration issues. In short, this is when the sun provides too much energy – more than the demand that exists for it on the grid – and curtailment protocols are required to reduce the amount being generated. This makes solar power more expensive and hurts its environmental benefits. As RPS (Renewable Portfolio Standards) goals continue to increase overtime, the costs associated with overgeneration will, too. This makes it incredibly important for states with ambitious RPS goals to address the grid’s current issues. The way for renewable energy developers to overcome these problems is by using wind and solar together. Due to when they peak, sun and wind are perfect complements for one another. During the day, solar installations can use the sun to generate power for the grid. Then, as it begins setting and its contributions drop off, the wind begins picking up. This will provide the energy the grid needs to distribute an uninterrupted source to consumers. The complementary nature of wind and solar will also help the grid beat overgeneration problems. Essentially, as the two produce a more reliable source of power, ramp-up and peak-shaving will be reduced. As renewable energy developers and policymakers better understand the benefits of using solar and wind together, it should also become easier to appreciate the importance of greater grid-system penetration. This will allow increased harvesting of both renewable energy sources. Increasing the installed capacity of the grid system will be vital, as well. By doing so, wind and solar will be able to offer a measurable baseload, which will further their combined potential as the dominant form of power in this country. Ideally, wind and solar farms will be placed throughout different regions. They should also be interconnected. Both improvements in our current grid system would make it possible to cycle energy from around the country as necessary. Again, this would make power production more reliable while addressing challenges like overgeneration. 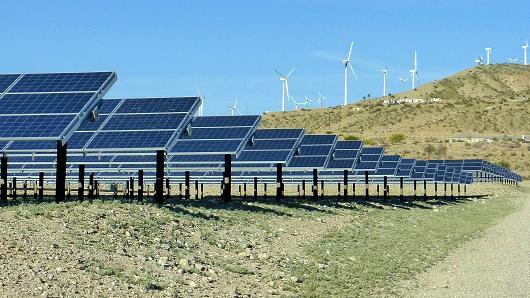 Another reason renewable energy developers are focusing on wind and solar together is that the combination is more affordable than alternative options. This is actually true for several reasons. When ARENA built their Gullen Solar Farm next to a preexisting wind project, Frischknecht reports that the company saved as much as $6 million, which cut the cost of the entire build by 20%. That’s not the only reason this approach is more affordable, either. Another is that scale is not as important for a plant to be competitive when they’re co-located like this. This means that the future could involve medium-sized solar PV plants. When ARENA did a study on the potential for these smaller plants, they found that preexisting wind farms in Australia could produce approximately 1,000 MW. That would be enough to power roughly 700,000 homes – again, without the same kind of overhead required to build traditional plants that work on their own. The types of batteries renewable energy developers require may still be expensive, but using solar and wind together would help reduce their costs. Many communities utilize a microgrid system. This is one that can disconnect from the larger macrogrid and run autonomously. These are especially popular in communities that are too remote to draw power from the macrogrid. Those microgrids that generate power from photovoltaics need batteries as people require energy even when the sun isn’t shining. However, as the wind is usually blowing long after the sun goes down, it can provide energy without the same battery costs. This means renewable energy developers can bring power to remote regions all over the planet. Finally, by using wind and solar together, renewable energy developers will have an option that can compete with the price of other new sources. If renewable energy developers are ever going to free our country of our reliance on traditional types of energy, they need to understand that solar and wind must be used together as a single source. This understanding will help usher in a new version of the grid – one that caters to the combination of wind and solar – so their full potential can be tapped and shared throughout the nation.